The WETLAND series are designed for birdwatching and nature viewing, the 10x25 is ideal for those occasions when looking over the hills and valleys. The 10x magnification brings the subject closer then the 8x model, whilst still giving a good field of view and bright image. Twist up/twist down eyepieces make the Visionary Wetland suitable for both for spectacle and non-spectacle wearers. Supplied with case, strap and a 10 year manufacturers guarantee. 22/11/2012 15:04:35 Could you please advise me bout the guarentee? 22/11/2012 15:14:01 Thank you for your enquiry. 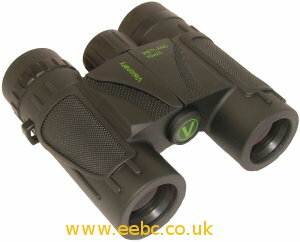 The Visionary Wetland binoculars have a 10 year manufacturers guarantee. I have now added these details to the product description above.